By the end of 1895, the only section of the Union Loop without a franchise was its southern leg. Levi Z. Leiter, owner of much Loop property along Van Buren, strenuously objected to this alignment. Uninterested in compromise, Charles Tyson Yerkes created a new company, the Union Consolidated Elevated Railroad with its purpose not only to build the gap between Wabash and Wells, but also the connection to the Metropolitan West Side Elevated. Unable to sway the opinion of Leiter and his associates, Yerkes announced that he'd build the Van Buren leg from Wabash to Halsted Street, a distance of one mile. The western half of this included mostly warehouses and industry who were at best excited and at least indifferent to the presence of the elevated. Their consent signatures coupled with those already obtained east of Market Street were all Yerkes needed to proceed. Of course, Yerkes never intended to actually build the structure west of Market. Construction east of Wells began in late 1896. The Loop "L" as a whole, including the Van Buren leg and Dearborn/Van Buren station, was activated October 3, 1897 and first served by the Lake Street Elevated. The Metropolitan followed in October 11, with the South Side trailing on October 18. Originally, all four sides of the Loop "L" had three stations. Dearborn/Van Buren was one of the three on the south side. Like all other sides of the Loop, the Van Buren stations had a uniform design, unique to their section. Although hardly high-style architecture, its rectangular form, gable roof with small dormers, smooth Tucson posts, fluted pilasters, large double-hung windows, and unique ornamentation in the pediment lend it to the Colonial Revival style. This architectural style can not be found anywhere else on the "L" except for Dearborn's sister stations at State/Van Buren (long demolished, but recently replaced) and LaSalle/Van Buren (the only original Van Buren station left). The Van Buren Loop stations are unusual for their execution of a Colonial Revival design in sheet metal and tin. The station house interiors featured wooden floors, pressed tin walls, and tongue-in-groove wooden wall paneling. The ticket agents' booths were integrated into the trackside elevation of the building, with windows and doors from the booth both inside the station house and onto the platform. Originally, the separate "L" companies did not offer free transfers and separate facilities were maintained for each company's trains. On the Loop, each platform was divided in half, with a barrier in the center, to partition the platform into two separate berthing areas. Likewise, there were two ticket agents in each station house, one for each "L" company, and separate paid areas were maintained within the station houses for each company. If one wished to transfer from one company's train to another's, they had to enter the station house, pass by an agent again, and pay a second fare to gain access to that company's paid area. 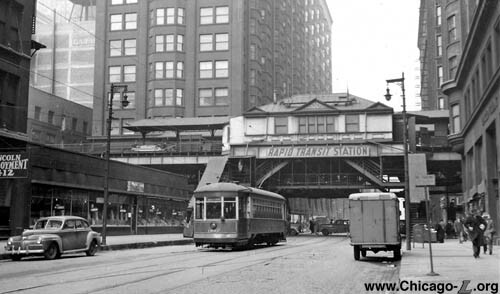 Originally, on the Inner Loop side, the Metropolitan "L" stopped at the east end and the South Side "L" used the west berth; on the Outer Loop, the Northwestern Elevated used the west half while the Lake Street "L" was assigned to the east berth (the Loop originally operated as a left-handed railroad). After universal transfers were instituted in 1913, these barriers and separate paid areas were eliminated and passengers could pass by any agent and use any door onto the platform and still access their desired train. The original platforms featured canopies of steel supports with gently-curved brackets and intricate latticework, covered by hipped corrugated metal roofs. The original railings consisted of tubular metal frames and posts with panels of decorative metalwork inside. The floors were wooden decks and the lights were incandescent, strung along conduit under the canopies and attached to shepherd's crook poles with porcelain-glazed "pie pan" shades outside the canopies. 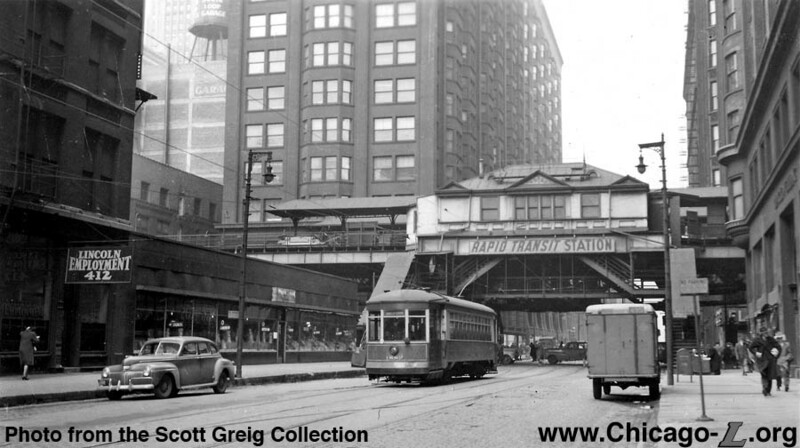 As part of an ongoing platform lengthening effort, the platforms of State and Dearborn had been lengthened to the point of connecting, creating a station referred to as State/Dearborn. By 1930, all three Van Buren stations had been lengthened to the point of being continuous from State to LaSalle (but, at the same time, Dearborn seems to have also regained its individual identity as a separate station stop). In 1949, Dearborn/Van Buren was closed, removed in one of the CTA's many early service revisions. It's station house and platforms, however, were retained and integrated into the adjacent State/Van Buren station one block east as an auxiliary exit. The station houses were also staffed with ticket agents and available for entrance during the evening rush periods. On Saturday, July 20, 1968, an explosion at the southwest corner of Dearborn and Van Buren streets rocked the South Loop and severely damaged the old Dearborn/Van Buren station. The explosion, which police and fire officials suspected was caused by a gas leak, leveled almost the entire block between Dearborn and Federal streets along Van Buren. The tracks on the Van Buren Street "L" structure were "torn up", according to the Chicago Tribune, and narrowly missed a Lake Street train that was scheduled to arrive at the station four minutes after the blast. Service was restored to the tracks along Van Buren Street at 5:30am Sunday, but damage to both the tracks at the old Dearborn/Van Buren Outer Loop station house was extensive. 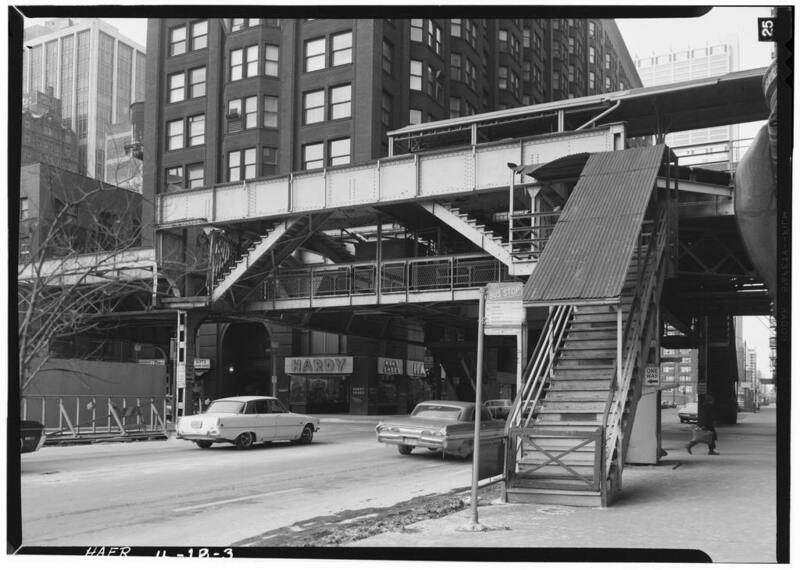 As a result, the entrance to State/Van Buren through the old Dearborn station houses was closed on July 20, 1968. Following the explosion and damage to the Dearborn/Van Buren station, these little-used sections of infrastructure began to be removed. On December 6, 1968, the unused portions of the continuous station platforms along Van Buren Street (as well as along Wells Street) were blocked off from passenger access. 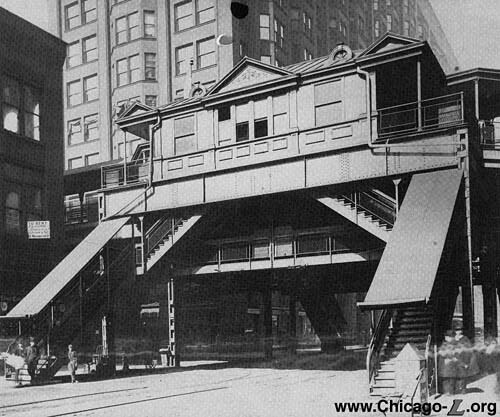 The station houses at Dearborn/Van Buren were removed by 1971, as were the stairs to the southwest and northwest corners of the intersection. Only the southeast and northeast stairs from the street, the mezzanine, and the stairs to the platforms remained and served only as an auxiliary exit from State/Van Buren. The State/Van Buren station, including the access from the former Dearborn station, was closed on Sunday, September 2, 1973 in one of the several rounds of cost-cutting that year due to budget shortfalls that included multiple station closures and service reductions. The unused structures along Van Buren Street remained largely in place until 1975. 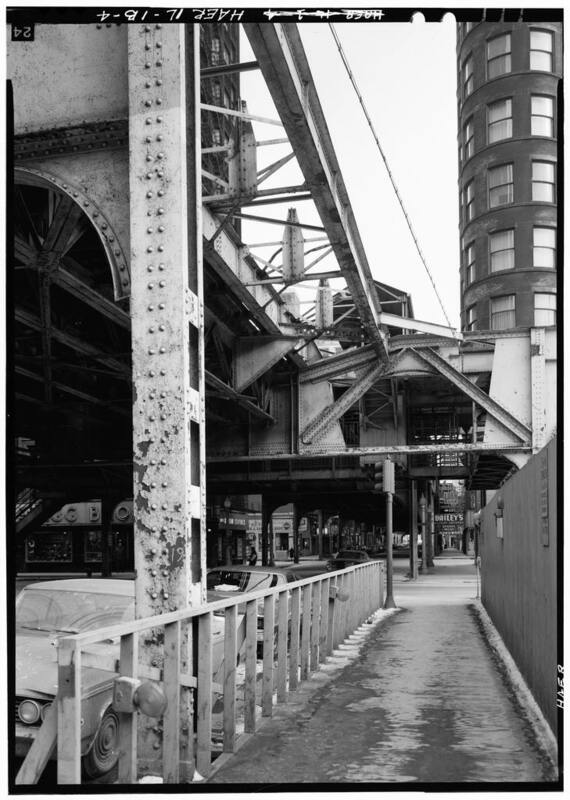 By Autumn 1975, the unused sections of platform and closed station houses between Wells and Wabash were razed, as were the unused stairways and connections to adjacent stores and buildings. Approximately 615 tons of steel were removed in the project, whose goal was to save on maintenance costs and allow more daylight to the streets below the "L" structure.